Precious gemstones can enhance the appearance of any jewellery piece. Precious stones include emerald, ruby and sapphire which are popularly demanded by young and old alike. These stones look magnificent and suit any women irrespective of the age. There are so many fake gemstones that are selling in the market that identifying the real ones can be a difficult task. However, ignorance is the major reason for being fooled with a fake gemstone. Before you buy a gemstone of your choice, be aware of the parameters that determine its price and quality. This can help in picking the right quality of gemstone tagged with the best prices. The following post will guide you in purchasing the gemstones like ruby, sapphire and emerald. Rubies have an attractive shimmer that can leave the buyer mesmerised. It is irresistible and goes perfectly well with the gold lining. Rubies come in different quality and look beautiful on any lady. It comes with natural spots and lines which cannot be fully avoided. However, when you purchase a ruby, hold it against the light to see through the lines. Choose the one that has minimal lines and spots so that the shine and radiance is not affected. Just like the diamonds, rubies are found in different shades of red and pink. The most expensive ones are those with deep red and limited inclusions. It is worthy to note that even small sized rubies may cost you much higher if the inclusion is negligible. So, it is a combination of size, colour and inclusions which needs to be compared at par to pick the best stone that can adorn your unique piece of jewellery. Getting a completely flawless ruby can be near to impossible and so never search for such a thing as your search will end in vain. Also, take diligence to ensure that you visit several jewellery shops and make an informed decision by comparing the cost, purity and weight. Yet another fascinating gemstone that comes in a luxurious green and depict true royalty are the Emerald stones. A single large emerald on the ring will suffice to leave your onlookers dumbstruck with awe. Emerald that comes with a deeper shade of green is pricey collection. The genuineness of this stone can be tested through the cut, clarity, colour and carat. Emerald are also not free from flaws and includes the cracks and spots which are natural and does not affect its genuineness. However, the pricing of the stone is based on the presence of these spots. Minimum spots means higher price and vice versa. 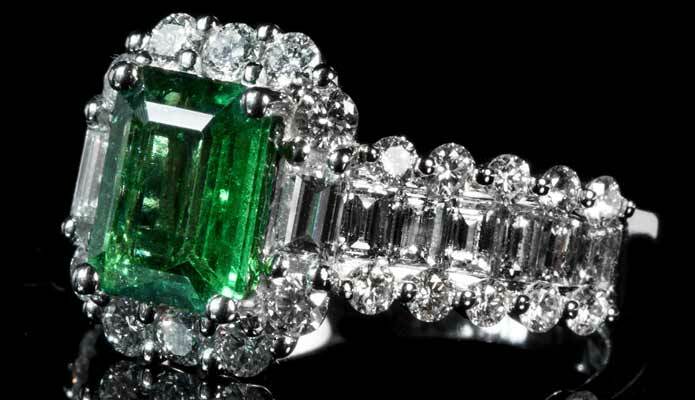 Emeralds are measured in carats and heavier ones will have higher price tag. Be careful when you pick the real emerald as there are synthetic emeralds which may be difficult to distinguish. Always purchase the stone from a distinguished and reputed dealer in gemstones. Stone of destiny, sapphire comes with a natural power to defend against all evils. This is the reason that they find place in many of the jewellery pieces. Sapphire is available in different colours like pink, brown, yellow, orange, and green and purple. However, the most popular colour is shades of blue which represents joy, peace and beauty. Clarity of the stone depends on the lines and inclusions. However, this stone has lesser flaws as compared to ruby and emerald. Heat treatment is a must for the sapphire to enhance its shimmer and thereby gives strength and resistance against chips and breaks. Being a hard gem, sapphire is very good for daily wear jewellery unlike emerald which is not suitable for rough use. Marlow Marshall is a pioneer in the diamond jewellery segment. His exquisite designs and uniquely Custom jewelry makes his clients feel proud as they flaunt it with style and class.